Morgan, one of my one-eyes! We are about five weeks out from Hazel’s passing. I still miss her and so does Morgan. She has become more needy. (A nicer person would say affectionate.) Other than her major naps, she likes to be near me. Like Velcro. She has always been a friendly cat but independent. She’s won’t crawl into your lap (Gracie will do that with the intention of paralyzing your legs). She doesn’t sleep with us (that is Mollie’s job) although she’s often in the same room on the lounge chair. She was around but never attached. I’ve tried to be more attentive and give her things she loves. Catnip, cat grass and then I found something new. When Hazel was alive I didn’t do treats because of her diet. There was no way I was giving tasty morsels to three cats and not to the other one. I found a bag and gave some to Morgan. Now we have a ritual that requires treats. She sure learned that fast. She will be seven this year. The time has gone so fast. Here are some fun pictures of her over the years. Shortly after joining us. 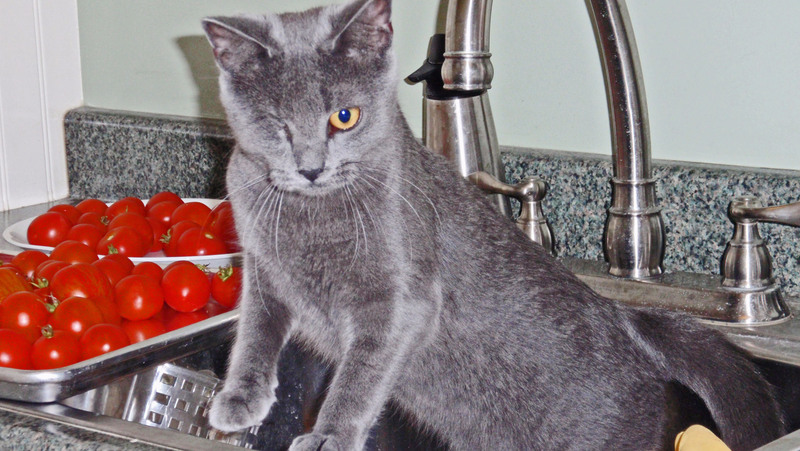 She was in the laundry room sink hanging with my tomatoes. She was just under a year old. Very intrepid. Hello Cortana! She is ready to engage my computer in some mischievous behavior. And yes she has done that. I have heard conversations with Cortana when I wasn’t in the room. Scary. I’m grateful she can’t read my credit card. Gracie (left) and Morgan doing a meet and greet. I’m fortunate that they are friends, often playing chase through the house. There is the occasional mishap where something falls to the floor. They are cats after all. Snoozing with her buddy Hazel. Hazel was the universal cat that got along with everyone. This header is my favorite of all. There is a trust and innocence that comes through for me. Although picked up as a stray, she was obviously around people. She was very socialized and not fearful of anyone. She is still like that although sometimes when we have guests she prefers to nap. Perhaps she thinks they are boring. Not bringing treats or catnip toys. What were they thinking? Morgan checking from under the bed. Always went where no cat should go. The duck and vase on the left are both history. There are always casualties. All the cats wish you a great weekend. 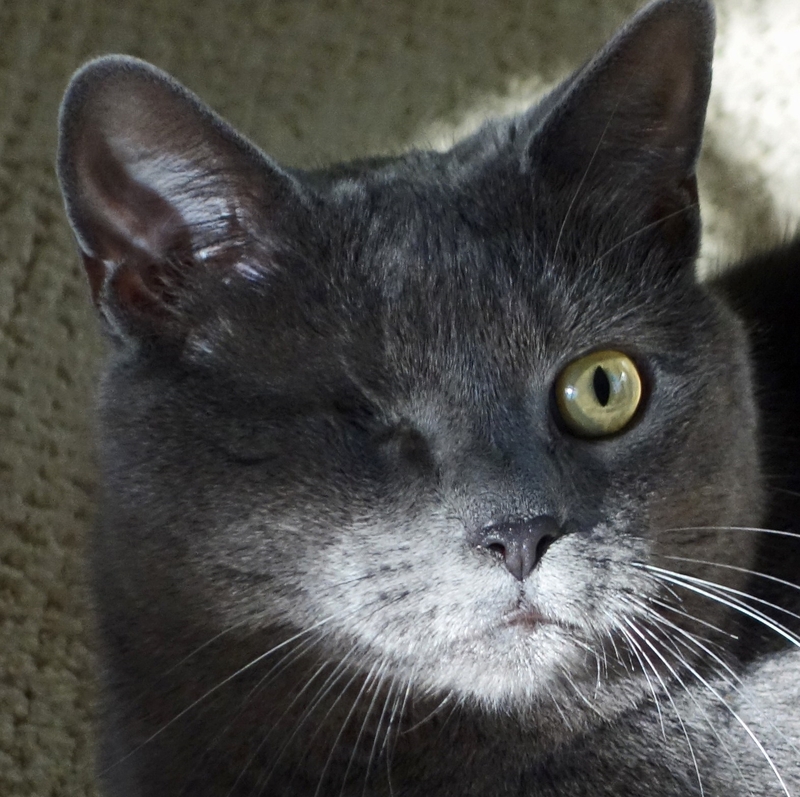 This entry was posted in Cat Adoption, For Animal Lovers Only, Humor, Sassy cats and tagged animals, cat behavior, cat mourning, cats, Gracie, Hazel, Morgan, one-eyed cat, pets by Kate Crimmins. Bookmark the permalink. “Always casualties” Hey Morgan thinks a cat is a much better mantle accessory than inanimate objects anyway…besides, someone has to be in a towering position to keep one eye on things. The header is cute, but the picture of Morgan peeking out from the covers is tops with me. Morgan does the most entertaining things. More so when she was a young sprout. You know how age is. Still likes to mix it up though. We are carrying on. I think loss and sadness is always a time for treats, so I’m glad you found a way to share with Morgan. Everybody’s place in the family system was interrupted when Hazel left you. Anyone who doesn’t understand an animal’s sensitivity hasn’t spent any time in their company! They did! They always do! Beautiful photos, Kate. I am glad that Morgan is enjoying the new treat rituals! She definitely is. She reminds when it’s time and has been known to sneak in the pantry and put bite marks in the packet. Nice that you have a photo of some of the lost treasures. Photos and memories are all I have of those two pieces! Aww, Morgan. I am glad you found a ritual with her, Kate. She is such a sweet cat. She is working through it just like you. I wanted so much to help Z and I couldn’t make it happen. But you are making it easier for Morgan to deal with the loss of Hazel. I am not surprised that Morgan is having a bit of confusing time. I think it is a plus that you have a multi-cat home. Provides distraction for Morgan and a sense of every day-ness that comforts.♥ I enjoyed Morgan’s Sassy Cat pictures this morning. Thanks! I have lost “only” pets in the past and like a multi-pet household. We all hang together and it’s easier. And hoping for a great weekend for you and the cats too! Interesting how the loss of one of a group of cats affects the others. Morgan (and the others) are lucky to have such a great person to help them adjust to the loss! I’m mostly surprised that I only see behavior in Morgan. I wonder if Gracie would miss me! When her food dish was empty! The others may be having more subtle behaviors. Also, you know all your cats would miss you like crazy! I love that header picture too … as a teddy bear collector for years, who can resist cute and cuddly? She slept with that bear all the while when she was young. Mollie has a rabbit she plays with. Gracie is still attracted to catnip mice. I like watching pets play or sleep with their comfort toys – there is such a sense of peace watching them do that. We all need some symbol of comfort. I hear ya about the treats. With Sophie, she can’t have most. Since the cats eat very little dry food (more like a snack at night), I have a jar of Sophie’s prescription diet dry food in a jar and pretend it’s a treat. She buys it. Hazel loved dry food but couldn’t (or shouldn’t) eat it so I got a dry that was specifically for her and occasionally gave her that as a treat. Morgan has taken a big like to the treats (when I adopted Gracie they gave me two pouches but Gracie wasn’t interested) but neither Mollie or Gracie will eat them. Ok with me. I’m never sure if packaged treats are just fancy kibble or really unhealthy for them. I love reading about the cats and your interaction with them. I’d send them hugs if they would accept them. Sweet kitties. Most cats are needy – except Foster who likes to roam the neighborhood at night and sometimes go missing for a week. What can you expect from a feral stray? I keep telling H we need a cat that will let us love it. He keeps saying no. If one mysteriously showed up one day. I bet he’d love it. Jake was our last indoor-outdoor cat. I wouldn’t do that again. Too nerve wracking as we have both foxes and coyotes here. It would be nice to have a sweet one just show up. Rarely happens unless you help it along. 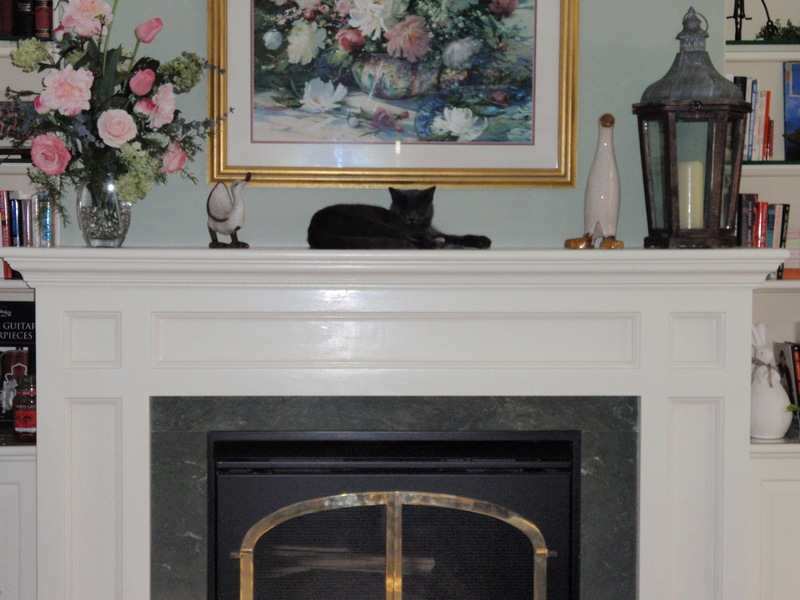 She thought she totally belonged on the mantle. Fortunately it’s been a few years since she ventured up there. She’s bigger now and there would be more casualties. I like to think that Morgan is consoling you, and you her. Very sweet. I love the picture of her with the Teddy Bear… and peering out from under the bed. She is very easy to photograph although lately most of the new ones are of her sleeping. She is a great cat. Do you keep a tally of how many times you feature each cat? If so, and the other cats get wind of it, Morgan is going to get some razzing from them. Although I understand why she makes it into your blog so often, she’s a sweetie. I would have guessed Gracie. She is the little imp. Mollie takes excellent pictures but as a senior her life isn’t as exciting to write about. Her fur is beautiful There is a sheen on it that makes it look silvery around the edges. It doesn’t photograph well but in person it’s unique. Many visitors have commented on it. I’ll bet they have! I just want to grab a hand into her fur and luxuriate in it! Probably you should keep me away. It looks so thick and rich. It probably smells good, too. She’s a clean cat so she’s good smelling but my old Jake (when he was younger) has a very silky black coat and I never had a cat that smelled as good as he did. I would sink my face in his fur and breathe. Ahhh, I get it. Nothing is as comforting as the scent of a healthy loved one- dog or cat. Sweet. Curious, do your cats have claws? Sweet story. We’ve had cats that had a hard time losing their buddies too. I’m glad you found that she loves treats – something new and fun,. I’m enjoying the attention too. It’s been nice. She will sit in my lap when I’m on the computer. Not good for getting stuff done but so what. Our dog got more needy when our oldest dog died, they were constantly together. He needed to be with us more but I suppose nobody had pointed out to him that we weren’t dogs too! 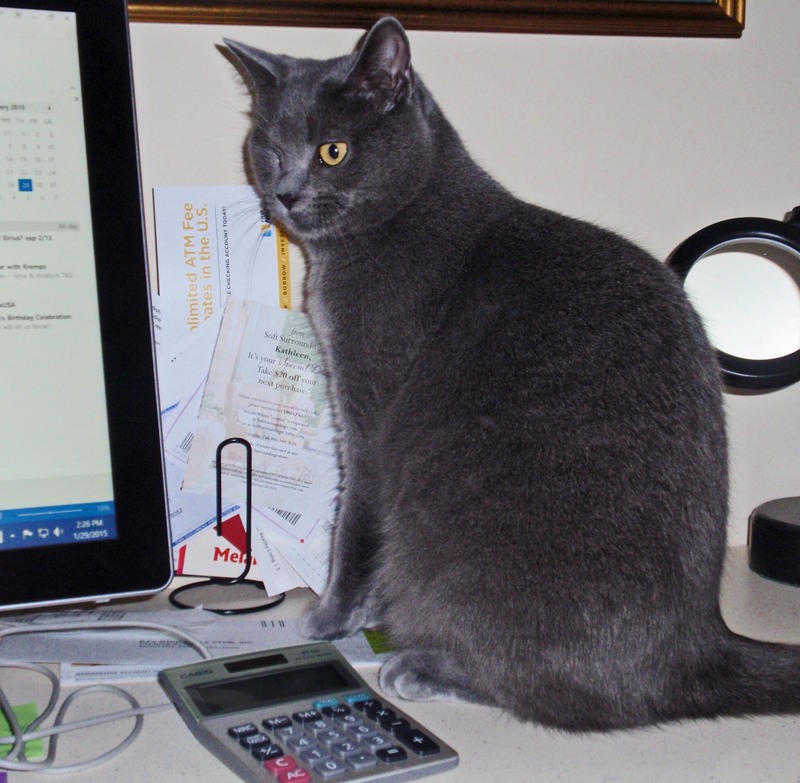 Our cats think we are huge cats with working thumbs. I have heard that dogs are much more sensitive to loss. They buddy up tighter than cats do although some cats mourn. Aw…I’m happy you and Morgan have each other. Absolutely adore that first picture with the teddy Kate. So hard to believe it’s been five weeks since losing Hazel. Can’t believe it’s been 6 years since we adopted Morgan. It’s like she’s always been here. When she was young she often slept with that Teddy. She doesn’t anymore. Treats seem to be very popular with her. So far, Gracie has no interest. Sweet! Sorry that she (and you) are missing Hazel. It’s been interesting watching it all. I haven’t noticed anything different with Gracie or even Mollie. Hazel came here about 3 months after Mollie (she was really Mollie’s pet) and they were close for a long time. Mollie gravitated to staying upstairs and didn’t like sleeping with cats so after a few years they rarely spent any time together. Morgan is the only one. I have tons of pictures of Morgan and Hazel together. Somehow that friendship jelled early and remained.